This post is long overdue because we actually saw the play over a month ago. But the fact that I’m still thinking about it all these long days later is testimony to its power. What reminded me of it most recently, though, was word that the Playhouse Theatre’s production of George Orwell’s 1984 is staging its final performance on August 23, 2014. So this is pretty much your last chance to catch a show. And if you happen to be in London this month, you really should. It’s flat out amazing. There’s a good chance you already know the story of Winston Smith and the dystopian police state overseen by Big Brother. Most of us read 1984 in high school. Not much is changed in the theatrical version, although the director did take some license in how he tells the story. The surprise, though, isn’t in how the tale unfolds or even how it ends; that we mostly knew. What’s shocking is how well it is told. Instead of starting at the beginning, with Winston heading home from the Ministry of Truth to write in his diary, it starts in some unspecified present day with a group of people discussing the relevance of Orwell’s writing to the world today. In a series of challenging, yet totally engrossing, flashbacks and forwards a confused Winston bounces between worlds, taking theater goers along for the disorienting ride. It’s a sophisticated, and sometimes subtle, production. Big Brother’s practice of “unpersoning” enemies of the state by erasing all their historical records is illustrated, for example, by quietly removing characters from a repeated scene. In other instances a simple shadow that is strangely disconnected from any of the on-stage actors stands in as the ominous embodiment of Big Brother’s constant surveillance. If these clever Easter Eggs were intended to draw me in and make me pay attention to every detail of the perfectly (and appropriately) timed 101-minute play, I can tell you the strategy worked. I can also tell you that such close attention to detail probably softened me up for the play’s more unsettling elements. 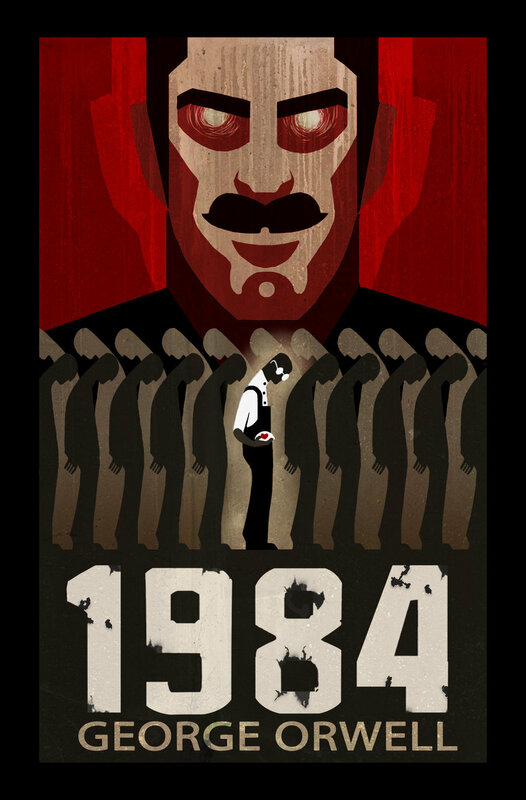 With masterful use of light and sound, 1984 creates more than a vision of a brutal police state, it creates the atmosphere of one. It’s a dark and disturbing adaptation worthy of Orwell’s work. We left feeling exhausted, elated and totally committed to re-reading this classic that has sat on our shelves untouched for too long. The imagery . . . .